Main Elementary’s IMC Technician Tammy Bondurant rallied teachers at Main Elementary to join forces and donate funds towards Books to the Rescue - a local nonprofit that donates brand new children’s books to first responders to help comfort children in crisis situations. Main Elementary teachers collectively raised $250 and Bondurant’s family matched that amount for a total of a $500 gift to Beavercreek Police. Books to the Rescue says 100% of those funds were used to provide Beavercreek Police with two Books to the Rescue Comfort Bags stocked full with more than 50 new books in each bag that combined could reach more than 100 children. Beavercreek Police say they will equip their COPP (Citizens on Preventative Patrol) vehicles with these bags full of books. Trained COPP Volunteers assist Beavercreek Police Officers at the scene of emergencies when needed and may be able to use these books at scenes where children may be involved to help distract, comfort or soothe them or even read to children to help them ‘escape’ from the current situation. 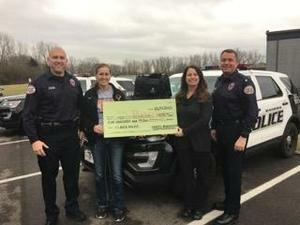 Starting in 2015, Books to the Rescue raised enough funds to stock every police cruiser in Greene County, including Beavercreek Police, and now seeks additional donations to help restock at no charge to police departments. To donate, go to bookstotherescue.org.